Whether you are a secondary school student, an undergraduate, a graduate, a working class fellow, a parent or a senior citizen, there's something for you next Thursday on the campus of Nigeria's University of First Choice. The Ambassadors Summit 2014 will be one Youth event you won't want to be told the story but experience it LIVE for yourself. WHY? 1. Not in every event will you find celebrities and accomplished Nigerians and even an expatriate from the Netherlands telling you their success stories with practical examples. 3. You will be able to see and interact with Africa's Youngest PhD holder(with 5 degrees at age 24), Nigeria's Wonder Kid, 13 years old Bowale Oyinda, with a fantastic memory ability and another Impressive Nigerian youth who addressed over 80 Presidents of Nations at a United Nations Meeting at only 16 years of age. 5. You will not go without give-aways, refreshments and a chance to win gifts ranging from products to smartphones (plus a chance to be on radio with the convener as a special guest). DATE: Thursday, 2nd October, 2014. Hint: Some special packages for participants who come early. THIS EVENT IS FREE AND REGISTRATION IS AT DOOR. 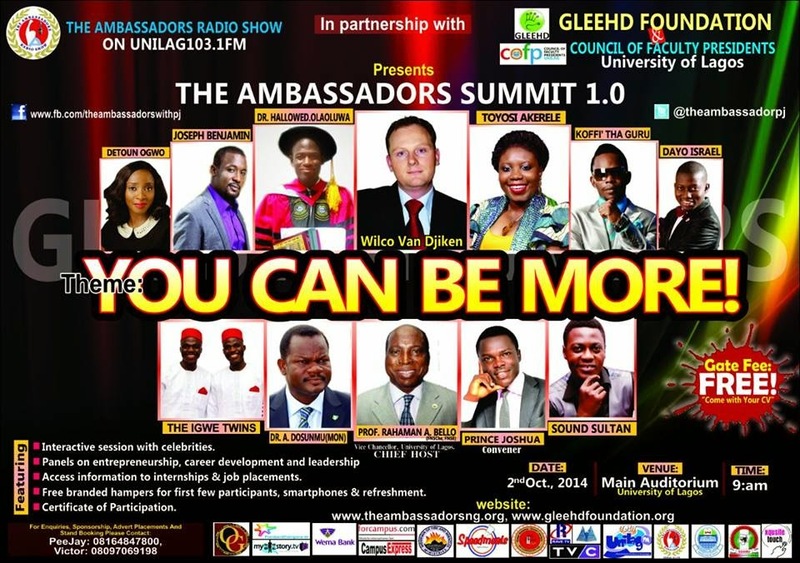 Proudly Brought To You by THE AMBASSADORS RADIO SHOW ON UNILAG103.1FM in partnership with GLEEHD FOUNDATION & COUNCIL OF FACULTY PRESIDENTS, UNIVERSITY OF LAGOS.